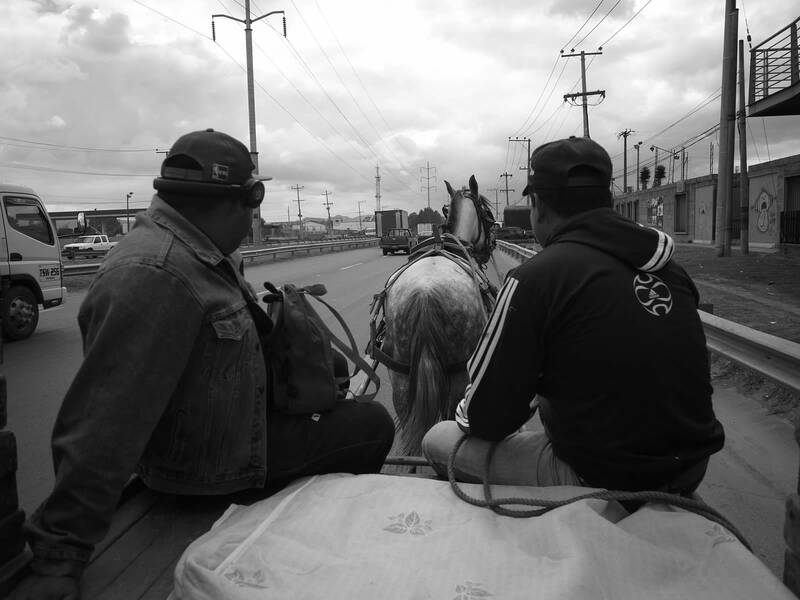 Horse-and-cart hitching on the outskirts of Bogota. “But aren’t you worried? !” People would ask us. “They will push you in.” He told us. In Chile, on the rugged, beautiful and slow-hitch Carretera Austral in Chile, a seemingly perfect gentleman came up to us on the side of the road and we got chatting. “But do you know what the main difference is between us Chilenos and the rest of the Latin Americanos?” He eventually asked us. “Food? Culture?” Emma hazarded a guess. We heard it too from travellers we met on the road and sometimes even on the farms. Savvy travellers wouldn’t go to Colombia because either their parents, their news-media or some stranger had told them that they would probably die. And yet, despite all of these facists, corrupt officials and violent, kidnapping terrorists, Emma and I managed to make it from the north to the south of the continent and then back again, without a single act of violence enacted against us. In fact, since being back in the UK we have suffered more aggression and unfriendliness in three weeks than the entirety of our trip. Cycling through London the other day, a driver nearly knocked Emma off her bike on a roundabout. He then swore aggressively at her and when Emma swore back at him with her middle finger he pulled his car up in front of her bike, opened the door on her, bundled out of his car and- hulk of a man that he was- towered over her, all-the-while shouting at her whilst pushing her toward a wall. His friends managed to hold him back just enough to prevent violence, and a brave passer-by even jumped in front of Emma to protect her. By the time I got back to her he looked about ready to tear everyone up. I somewhat loudly voiced my frustrations, which made me the clear target. I think the whole time we were one misplaced word away from a serious hospital visit. So, ladies and gentlemen: don’t go out travelling in the UK, you’ll nearly get killed and then nearly get hospitalised by some angry lunatic. Really, though, it’s that brave, selfless stranger we should focus on. The elderly man who jumped in-between Emma and the huge, crazed mountain of a man who genuinely looked ready to brutalise us. 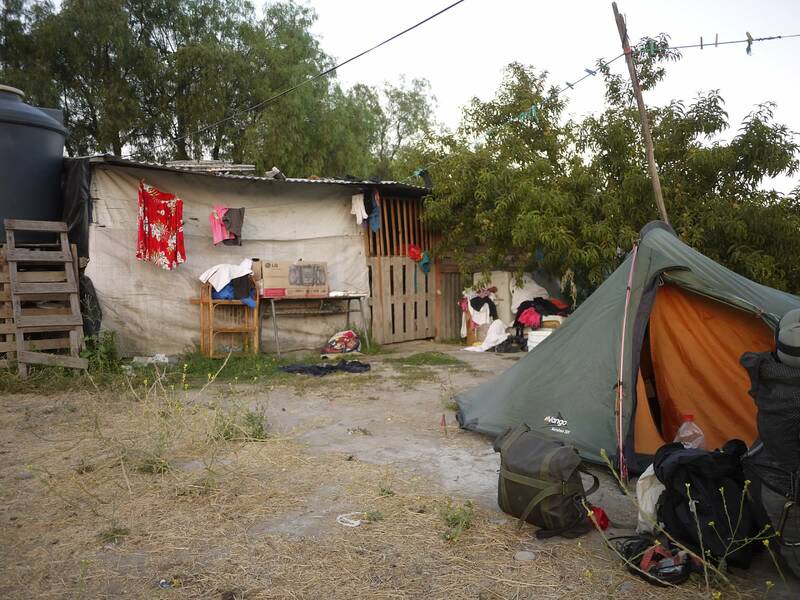 It’s the families with barely any money who invite you into their house for food, and the other families who live in towns ravaged just that night by violent protests and bandits roaming in the night, who call off their guard dogs and then invite into their home two complete strangers, carrying two huge backpacks and one large, clearly visible machete. It’s the truck drivers who have been shot and stabbed by hitchhikers and yet still pick up two more for two more days, just because they trust in people and want to help. Camping in a “dodgy” neighbourhood. We’ve met plenty of solo travellers- and many of them women travelling alone- who made their way safely through the “dangerous” places, and experienced profound kindnesses. If you want proof, Emma and I are it, and here is just one other example who even hitchhiked in the DRC on her own. We should never let the violent actions of a few people taint our view of the places we want to visit, or, even worse, stop us from visiting them. And more importantly, we should not let the Foreign Office website or the news media be be our sole sources of information about the other countries on this planet. Go and see for yourself. Just don’t be stupid, or too careless; be open, kind and trust people. You’ll get a pretty decent idea pretty quickly if you need to turn the other way, turn down a lift or call for help. Even in the remotest, most down-trodden and “dangerous” places we travelled to, more often than not there was some kind stranger willing to help. Out in the desert this gentleman picked us up and took us on an improptu tour. 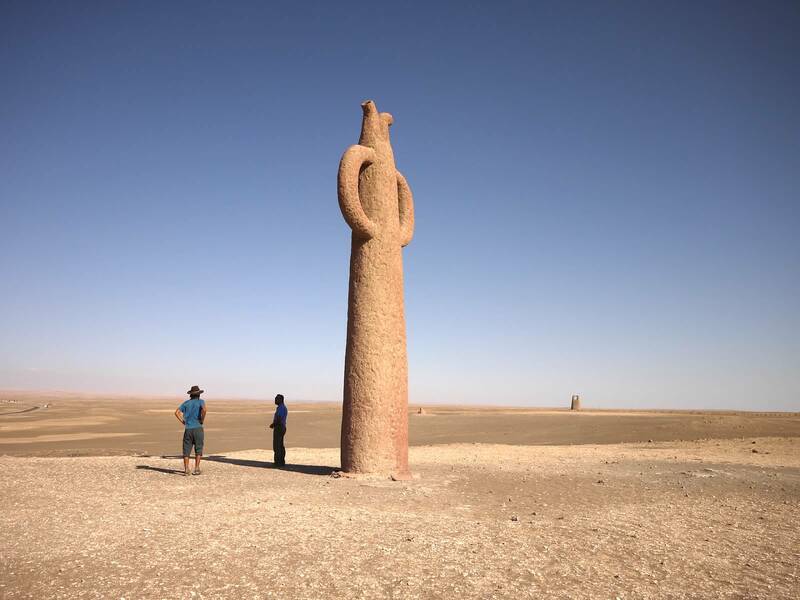 This momument is one of many “Guardians of the Desert”, as was he. This entry was posted in Bogota, Colombia, danger, dangerous, travel. Bookmark the permalink. So true! 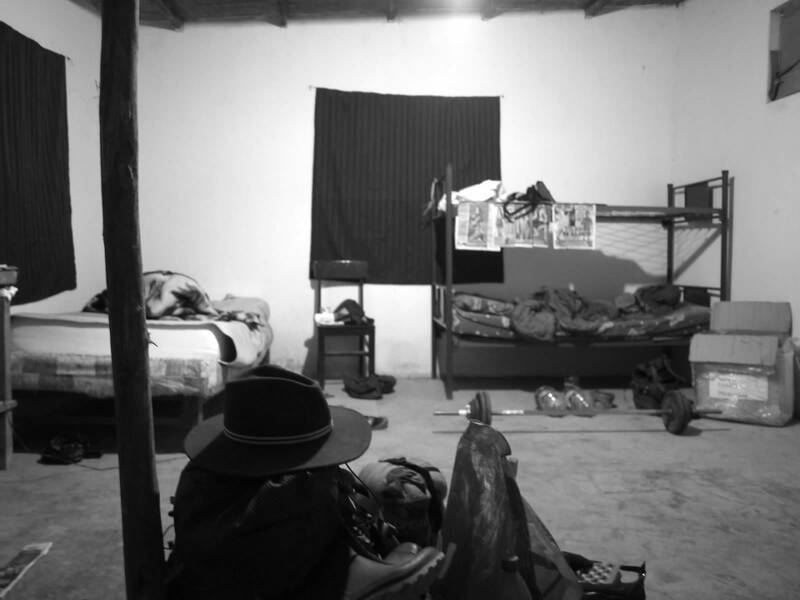 In my experience traveling in the more “dangerous” states in Mexico the locals would also warn me of the next state, or even their own state, yet often these more dangerous places where the places where I met the friendliest persons and waited less time for rides. That matches up to our experience pretty well! Funny, isn’t it, how it works out to be the exact opposite to what we are often told. I was reading Juan Pablo Villarino’s “Vagabundeando en el Eje del Mal” where he recounts similar things that you mention, that in the middle east each country would describe the neighboring country as being full of theives and bad people haha. Anyways, pleasure to read your adventures! greetings and happy trails! I shall have to try and pick up a copy of that book, I’ve heard of it a few times now. Thanks for the heads up! I was told the same! But I felt so safe in Bogota. There is police everywhere! Great article, and it is important that people understand that Colombia is not as dangerous as people say. I have noticed that usually it is just people that have never been there that says it is dangerous. But everyone I know that have been there say the same, and that it is safe. As long is you do not go to the jungle though.